Laura was born in Argentina and moved with her family to USA in 1989. Although her background is in Architecture, she favored art. After exploring several media, she discovered Fiber Arts which appealed to her because of its tactile quality, variety of textures and colors. 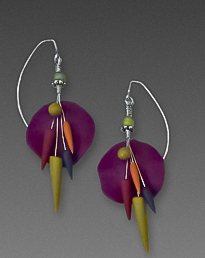 In 1995, Laura began making jewelry with polymer clay, becoming attracted to its vivid colors, its dimensionality and the diversity of effects and textures she can accomplish with it. Visit her Flickr site here. 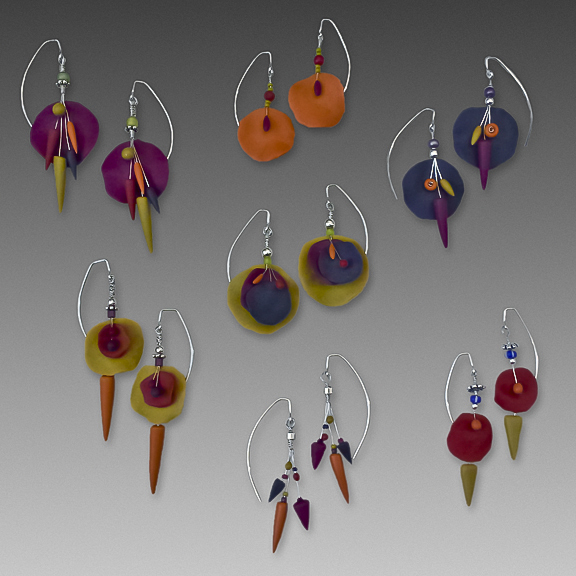 In this class students will design a collection of earrings. We will be working on developing a vocabulary of simple elements constructed with polymer and wire. We will embed the wire into each polymer element therefore becoming an integral part of the design, at the same time using it as its structure and visual element. If time permits several configurations will be finished in class. This class is suitable for students of all levels. Start developing your color palette!